Tiny Images: The existing iFrame display is meant to work on any setup and therefore, the design is very basic. Images of your properties should pop. These don't. No SEO: The content for the feed is using an iFrame. This method is actually displaying an external page, within your page. That means none of the content is picked up by search engines. 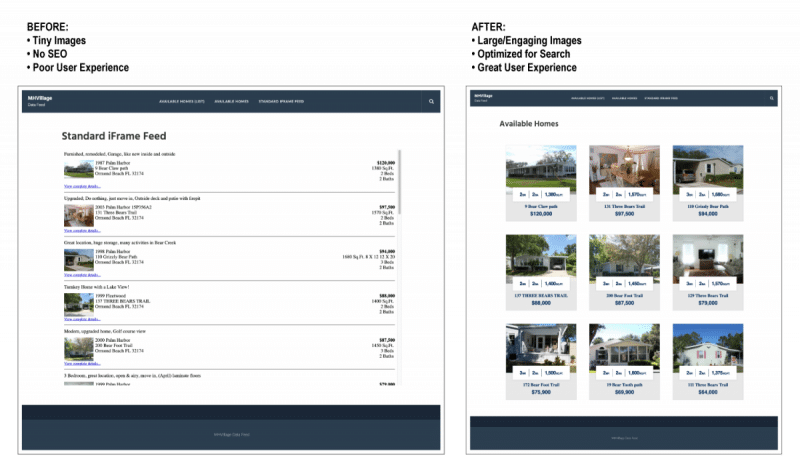 The iFrame saves you from double data entry between your MHVillage listings and displaying them on your website, however it is lacking a great user experience and there is no SEO value. Your homes will look great on any device. All listings content will adapt to each device on which it is displayed. All listing data is indexable by search engines. This is a huge improvement over the iFrame display. High SEO value. Listing data is taken from the MHVillage XML feed. No more double data entry needed to display well designed listings. Speed is an important factor for search ranking. The data feed is queried and quickly organized. Each listing will have it’s own URL which can be used when emailing to a prospect or in marketing campaigns. No need for double data entry. Your homes for sale come directly from the MHVillage listing feed for your community. All images are taken directly from the photos uploaded to the listing on the MHVillage website. When new features are added to the plugin, they are included in your purchase plan at no additional charge. This product is billed yearly until cancelled. Your subscription will give you access to continuous support and product updates. Lifetime License is available with a one time payment of $1,350.